“Over the river and through the wood to Grandmother’s house we go” was sung frequently by carolers in the late nineteenth century. If these singers were proceeding toward Prairie Avenue, they may indeed have crossed the Chicago River, and traversed through the considerable woods that were still in existence. Once they arrived at their destination, family and friends were in for holiday treats that would be rare delicacies for most of Chicago’s population. Several of this hallowed street’s residents founded or were in upper management in grocery firms, or meat-packing barons. They were well-suited to provide feasts. Samuel Tolman, who lived at 2031 Prairie, was the vice president of the grocery company that bore his family name. John Wesley Doane, at 1827 Prairie, presided over his family’s tea company. Marshall Field, whose mansion stood at 1905 Prairie, was known to have private rail cars of exquisite food shipped from New York City’s most elegant restaurants. He also stocked fine food in his own wildly popular department store. Finally, some of the best cuts of meat to be found anywhere would be prepared by the cooks at the 1215 Prairie home of Philip D. Armour. Prairie Avenue families typically consumed meals that were considered quite upscale for the time. During the holiday season, their cuisine existed on a grand scale that few of us can imagine today. Why and how did wealthy Chicagoans celebrate with meals fit for royalty? As mentioned above, many of the city’s founders made their fortune in providing food. Naturally, meat packing barons and grocery store founders had the wherewithal to eat well. With wealth came the privilege of having lots of help. As those of us who followed Downton Abbey know, affluent families had a retinue of staff to assist them in every conceivable way. Although Prairie Avenue residents many not have had the sheer number of people “downstairs” as did the Earl of Grantham, they would have had a well-equipped kitchen crew. Chicagoans most desirous of impressing their guests went out of their way to hire French chefs, as Parisian cuisine was then very much in vogue. A typical holiday meal was served in many courses with libations to accompany each course. Women in their tightly-laced corsets would likely gaze in fear at the sheer amount of food they might be expected to consume. A visitor not educated in the complex etiquette of the time would be mystified at the intimidating array of silverware and wine glasses at each place setting. Specially printed menus would be placed at each seat, so guests would have an idea as to what to expect and eat accordingly. Not surprisingly, Chicagoans had a wealth of choices for the many varieties of meat and seafood that were expected at a special meal. When Prairie Avenue was at its apex as a residential area, oysters were a prized delicacy, and no meal was complete without them in some form. Herewith is a holiday dinner, with actual recipes courtesy of the Prairie Avenue Cookbook. Click on each link for the recipe. A roast pig was a holiday favorite among Prairie Avenue families. Real estate listing books, that is. For sale: A beautifully maintained Cotswold-style home designed by Harold Zook, an architect whose whimsical, organic style endures in many homes in Chicago’s suburbs. This home sits atop a little hill on a popular street in my town. Since its construction in 1928, each owner has taken care to preserve the character and idiosyncrasies of a signature Zook home. Let’s take a look inside. Welcome home to a door with irreplaceable original hardware. Teardowns are big in my neck of the woods – what little woods there are left. They started about 25 years ago, when a few people, impressed with the fast train commutes and proximity to major expressways, dared to knock down spindly, termite-infested wood frame houses from the 1910s to put up tasteful brick houses. Then, they started telling their friends. Then, the developers started pricking up their ears. Suddenly, the town was booming, quite literally, with the sounds of earth movers, bulldozers, jackhammers and the yammering of newly minted interior designers teetering on their Jimmy Choos. My town became a mecca for anyone whose fortune was roughly the same vintage as a bottle of Two Buck Chuck, but was sufficiently large, thanks to the Internet Boom, Real Estate Boom, or the advent of hedge funds, to construct a Dream House. There was the French Country era, in which many McMansions sprung out of the ground looking like something you might find on an ersatz Provence tourism video. Now, the pottery roosters that used to grace Distressed Oak kitchen tables are crowing on card tables at garage sales. Pierre Deux upholstery has gone Duh. Then arrived the Faux Victorians, that tried and sometimes succeeded in imitating the 120-year-old creaky ancestral manse down the block. Then came the Coastal Homes, bloated shingle-style lot-eaters sporting too many weather vanes and resembling something Stanford White might have designed while ingesting too much champagne. The brilliant Mr. White, murdered in his prime by a jealous husband, might also have noted that the nearest coast is 20 miles away, making these houses just un peau incongruous. There were even a few new palaces straight out of the Arabian Nights. One of these was built by a man who purportedly owned a chain of dental clinics. Once the mansion was completed, the not-so-good doctor realized he’d blown his budget and fled to the Middle East, leaving his creditors toothless. A couple of years ago, a new breed started to rise from the hard, unforgiving clay that once enveloped 1960s ranch houses or 1860s Italianate villas. It was something people hadn’t seen before except possibly in a trendy decorating magazine. The wood siding is vertical! The windows are also vertical and trimmed in black! They have no shutters! If there’s any kind of stone trim, it’s all the same kind of stone! And they’re all white! It appears that after the first few were built, my town apparently issued an edict mandating that all new-construction homes going forward must look exactly like these Transitional Homes, the name used most frequently in describing these now-ubiquitous structures. The photos shown above are from real estate listings I perused as I wrote this post. With 316 single-family homes currently for sale in my town, some 15 are of the Transitional Home, or, as described in one listing, the Trend-Setting Farmhouse variety. Gosh, if I were working my fingers to the bone on a farm, I’d sure as heck want to make sure my house was Trend-Setting. I didn’t include all of the photos, because they all tend to look the same after a while. Same reason there are no captions, because they too would be interchangeable. Interesting? They were, before they started appearing on every block. Contextually appropriate? Not now, but I guess they will be soon, because it seems like every third house in town will be one of these Transitional or Trend-Setting Little Boxes. Treasure Houses? I’m thinking not. They will be teardowns 50 years from now. David Adler’s legendary Armour mansion, complete with its own recording studio, can be yours for a mere $13.9 million. 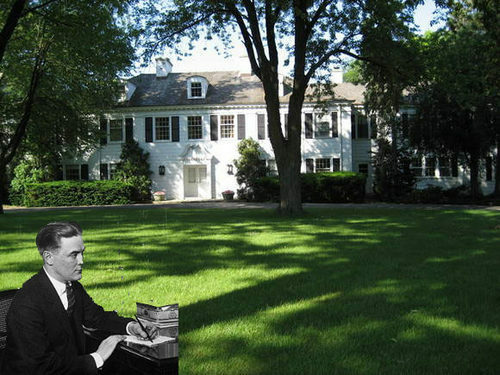 The Lake Bluff, Illinois home, constructed in 1931 for Lester and Leola Armour of the meat-packing family, has been owned since 1997 by singer-songwriter Richard Marx and his former wife. Marx initially listed the home and the five acres on which its sits on the shores of Lake Michigan for $18 million in 2014, but there were no takers. At the time of this writing, the home is the second most expensive single family residence for sale in the Chicago area. Although the home’s current iteration is that of the showplace of a successful musician, complete with rather stage-y Franco-Italianate interior design, the home has its own colorful history. David Adler, whose magnificent homes stud the shores of Chicago’s northern suburbs like priceless jewels, was a personal friend of Leola Armour. Such was the Armours’ respect for the architect, that when Adler presented them his designs for the Colonial-Federal style residence, they gave an unconditional go-ahead to Adler’s vision. Adler’s sister, designer Frances Elkins, was responsible for the home’s interiors. The home was photographed in 1940 by noted photographer Ellen Glendinning Frazier when the Armours hosted luminaries in town for the Democratic National Convention. As noted in the excellent New York Social Diary, the Armours’s guests included one John B. Kelly, whose daughter, Grace, would later become the Academy Award-winning actress and Her Serene Highness of Monaco. Leola Armour lived in the home until the late 1940s, when she and Lester divorced. Lester continued to reside there upon his subsequent marriage to Russian princess Alexandra Galitzine, who resided there until 1977. The home was rightfully added to the National Register of Historic Places. The mansion became a celebrity in its own right when it was selected to be one of the locations for Robert Altman’s raucous 1978 film, A Wedding. There are some good shots of the exterior and interior in the original trailer. “Wedding” stars Paul Dooley, Nina van Pallandt, Geraldine Chaplin and Carol Burnett are visible in this photo of the ivied entrance. While browsing the always-fascinating archives of the Chicago Tribune, I came across a news item from the January 20, 1934 edition about the auction of items from the estate of Edith Rockefeller McCormick. Mrs. McCormick, who died in August 1932, along with her husband, Harold McCormick, commissioned celebrated architect Charles Adams Platt to design the magnificent Villa Turicum as their summer retreat. Blueprints emerged from Platt’s dreams in 1907, and it took another ten years for the Italianate villa to rise on the shores of Lake Michigan in Lake Forest. The McCormicks reportedly spent $2 million on the home’s construction, and even more on the home’s interiors. Not the happiest of married couples, they spent little time at their stunning home. The home and grounds sold at a sheriff auction for an ignominious $51,524.00 in October 1933. A developer bought the languishing property and the 260 acres surrounding it in 1956. The once-magical home was razed. Here is an astoundingly beautiful website dedicated to the Villa. The ad for the sale.